As 40-year-old Mia Jensen lies dying on her kitchen floor after being viciously attacked by an intruder, she enters a dreamlike state where she considers what her life could have been. What if she had made a very different choice when she was a young woman? How would her life have been different if she had been a happily married wife and mother? A spy? An actress? A primatologist? Would it have been better or worse? Would she still have been murdered at age 40? Her sad state of events definitely makes her question her life’s choices. How much does one decision affect how your entire life plays out? If Mia had the chance to do it all over again, would it have been possible for her to live a completely different life? Or was she predestined to make the same decisions and the same mistakes? Many of these questions and more are answered in this powerful, moving and fascinating anthology featuring 16 multitalented authors, many of whom I've already read and loved, and a few more I now feel compelled to read. I don't typically enjoy short stories, but after seeing the impressive list of contributors, I knew I had to get my hands on this one. Overall, I found it to be unique and satisfying. In fact, a few of the stories brought tears to my eyes, which is a real feat, especially for a short story. I hate to play favorites, but okay, you twisted my arm, so I will admit that my favorite chapters --- in order of appearance --- are written by Kimberly Belle, Ariel Lawhon, Joy Jordan-Lake, A.F. Brady and Heather Gudenkauf. All five are amazing and so well-thought-out and executed. Every word counts in a short story, and I found theirs to be the most powerful, shocking and/or entertaining. I very much enjoyed this unique format. J.T. Ellison --- the brainchild behind this ambitious collaboration that she called “a piece of cake” due to “the incredible caliber of the authors involved” --- wrote the beginning, which introduces Mia and the premise of the story. Fifteen different chapters, or life paths, follow, with each written by a different author, providing Mia with 15 distinct and very different voices, personalities and lives. Finally, to bring the project to fruition, Ellison pens a meaningful and thoughtful conclusion to this complex narrative. It perfectly combines all of Mia’s lives into one final one, bringing tears to my eyes. 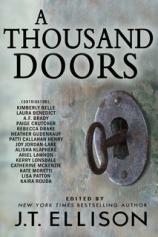 A decade in the making, A THOUSAND DOORS is worth the wait. Now, however, I am waiting again in the hopes that each of my favorite life paths will be explored in a full novel. Hey, a girl can dream, right?